FoG-N. Al (800 pt British) was beaten by Brett (650 pt Austrian). Brett still outnumbered Al with 150 pts less! John and Grant played a 500 pt 28mm DBR game with both using Samurai. The Scout hall is looking good now, with a bit of a tidy up and new lighting. Thanks to the Scouts for all their work there! WHFB - Dan and Rob had a Warhammer game, both using Orcs and Goblins. FOG-N - Kendall (Mixed Nation Corps) played Philip (Netherlands 1815), resulting in a mutual break. FoW - Steve had two games with his Soviet army, first against Lyndon's Americans and then against Kit's Germans. 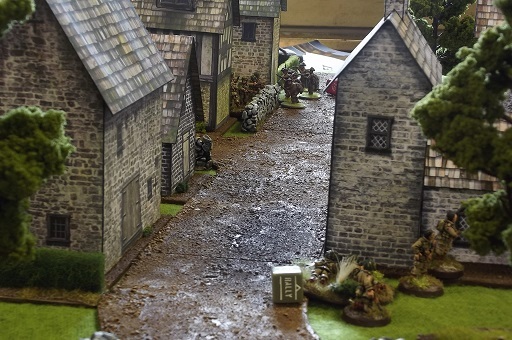 Bolt Action - Another WWII game with a marvellous table of terrain, including lots of buildings assembled by Scott, and which are available from Drive Through games. Mike (Ottoman) played Kendall (Mixed Nation) in FOGN as a pre-Melbourne training. Steve and Lee played in FOW as a pre-Wolfcry training. Rob played Wayne in SAGA, showing off some nicely painted Skraelings. Al played Kit in a WRG WW2 desert game. Von Goldsbury's Panzergrenadiers repelling the British of Donald. 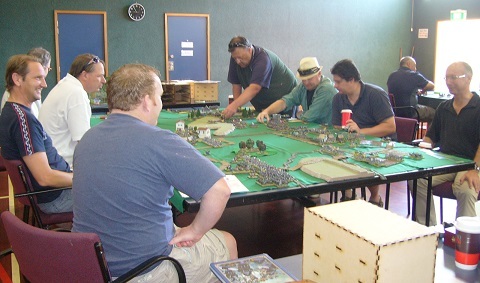 The North Island convention was held in Tauranga, and we entered the FoG Napoleonics competition. Al Donald (Anglo-Portuguese Army 1810-11) and Kendall Blue (Mixed Nation Corps 1813) also played on the Saturday, giving us two more games on the first day. The award for the best painted army was voted on by all the participants, and was also a close contest. Thanks to Blair and all the crew from Tauranga for a great convention. See you all in Thames for NICon 2015. Just like last meeting, lots of FOG Napoleonics happening at the club today. Mike (Peninsular British) played Brett (Austrians 1800). 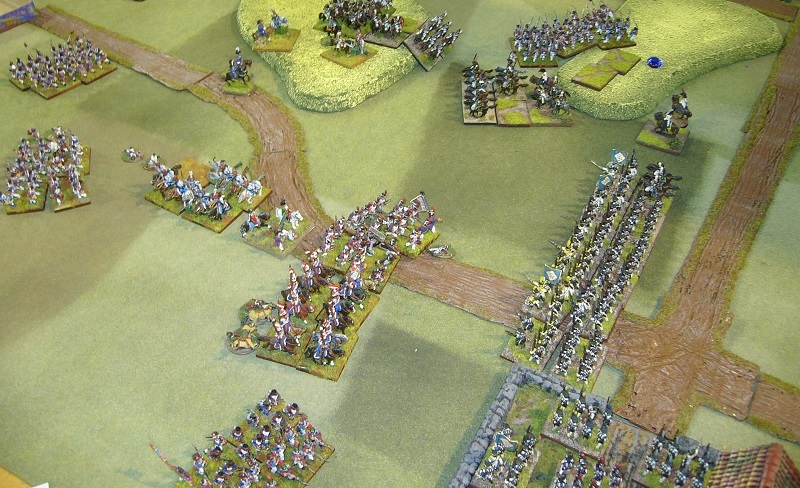 An Austrian flank march surrounded the British army but not in time to break them before the end of the game. An 18-7 draw in favour of the Austrians. Lots of FOGN practice games with Nicon coming up at the end of the month. FOG-N - Brett (1809 Austrian) and Kit (1815 Anglo-Allied) played with an exciting and bloody 16-9 to Brett. Steve, Rod and Lee played two FOW games. Rob did very well in the Flames of War late war competition, coming second with six 6-1 victories out of seven games. Our club provided 6 out of the 8 players in the FOG Napoleonic competition. Brett won the best painted army prize for his 1800 Austrians. Mike was first with the Ottoman Turks, Kit second with 1815 Brits, and Keith 3rd with the 1812 Russians. Just a couple of FOG-N games at the club today, as lots of people were away at Equinox. FoG-N - Brett (Austrians) beat Kendall (1814 Prussians and British). FoG-N - Philip (French Army of the Orient) beat Alan (Westphalians). Greg, Kit, Steve all got good mid-table placings. Saga - Rob's Skraelings took on Alan's Normans in three battles. FoG-N - Kit (1815 British) beat Michael (British Peninsular). FoG-N - Al (1810 British Peninsular) beat Philip (German Confederation). FOW - Mike (US Recon in Tunisia) beat Lee (German mid-war armour). FOW - Steve (Fallschirmjager in Sicily) beat Lee (German). Several of us went to Thames to put on a Napoleonic demonstration game. We had a 3000 point multiplayer game using 1815 armies. The allies (Andrew, Kendall, Kit and Philip) defeated the French (Brett, Mike, Rob, and Steve who came to join us from Tauranga). 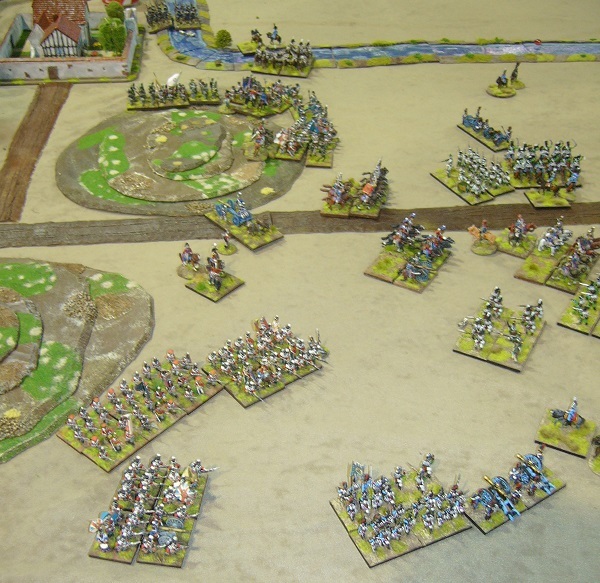 In addition to the Napoleonics, Al took his Spartans to join in the 25mm DBMM games. The event was held in the Thames War Memorial Civic Centre, a really good venue. Good potential for a future Nicon too! FoG-N - Brett (French Imperial Guard) beat Alan (Westphalians). FoG-N - Al (British 1810) beat Kit (British 1815). Continuing the Napoleonic theme of the meeting, we had our first two games of the Sails of Glory naval game. A good turnout from the club and some good results at BattleCry. Al ran the Moderns 1/300 competition, trialling the revised rules. Rob ran Flames of War this year. In FOG-N, 9 of the 12 players were from our club. Mike (1808 Turks) was second, Kit (1815 British) was third, and Philip got the best painted army prize for the 1814 German Confederation. FoG-N - Kendall (Prussians) played Alan (Westphalians). FoG-N - Michael (Ottoman Turks) beak Philip (German Confederation). FoG-N - Brett (Tyroleans) got a winning draw against Kit (British). 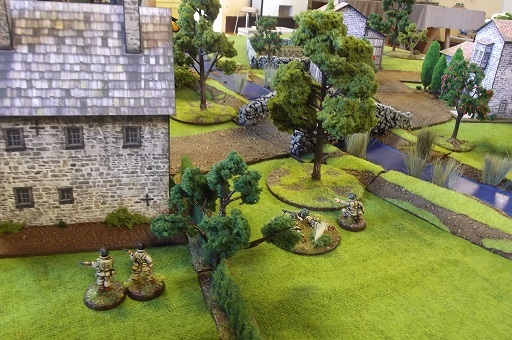 Bolt Action - More 20mm WWII gaming from John and Scott. FOW - Steve had two games, against Gervais' Hungarians and Rob's Germans. 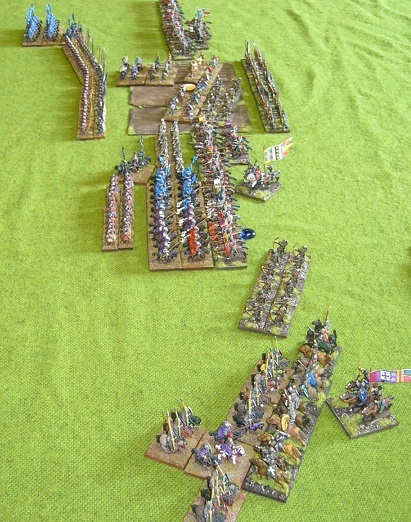 Congratulations to Stu for taking 3rd place in DBR at CanCon, using the Royal French 1658 army. DBMM 15mm - Steve (Late Romans) played Philip (Mithridatic) in a 500 point game. Both sides lost one command, and the game was a draw. DBMM 15mm - Brett (Alexandrian Imperial) beat Kendall (Normans). 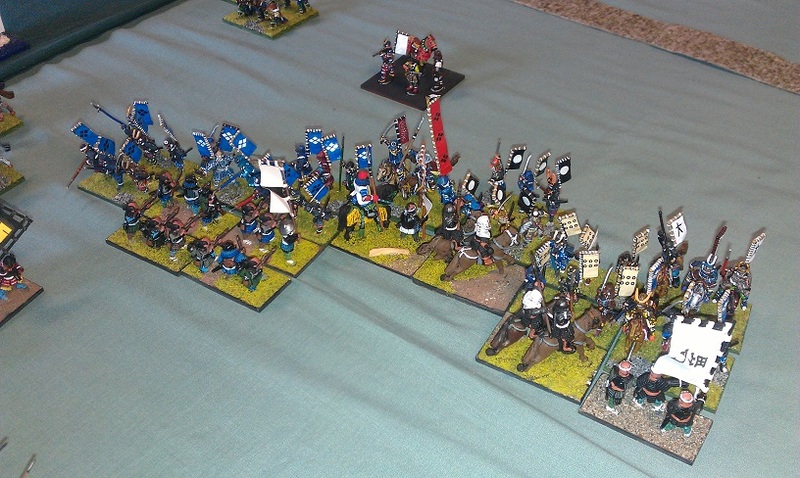 An unreliable Norman command let the side down, and the game was a 23-2 win to the brilliant Alexander. FoG-Ancients - Alan (Normans) beat Rob (Byzantines). FoG-N - Andrew (1814 Multi-national Corps) beat Shaun (1814 French). FoG-N - Michael (Ottoman Turks) beat Kit (1815 British). WHFB - Rob (Chaos Dwarves) beat Dan (Empire). FoG-N - Brett's Tyrolean Revolt army got a 25-0 win against Philip's 1814 German Confederation. FoG-N - Andrew's 1814 multi-national corps (Austrians/Prussians/Russians) defeated Kendall's 1815 Prussians (some newly painted AB figures on their first game). FoW. 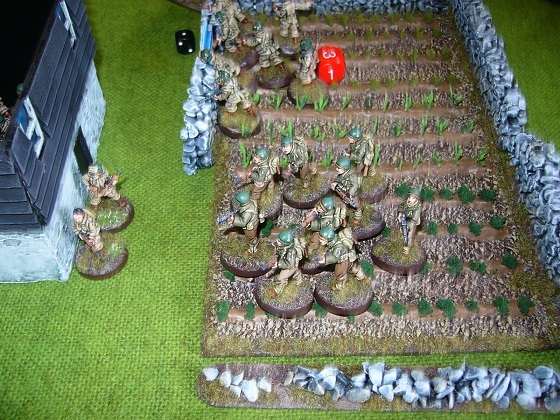 Steve's Heroes of the Soviet Union had a game against Mikes Germans, and two games against Kit's German grenadiers. Three heroic defeats unfortunately. The club's AGM was well attended, and we re-elected the existing committee. The next major event on the club calendar is the Napoleonics challenge matches with the Auckland club just before Battlecry.